Though parts of northern Mexico are arid, the country as a whole receives an average of 760 mm of precipitation a year (slightly over 30 in). This is a considerable amount, more than that received by either Canada or the USA. However, 73% of Mexico’s rainfall either evaporates directly or or is lost from plants via evapotranspiration. About 25% runs off into rivers and lakes. Only roughly 2% seeps down to recharge subterranean aquifers. 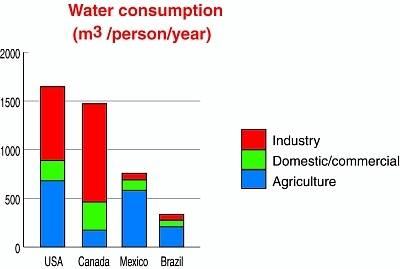 Mexico’s per person consumption of water is about half that of Canada but with proportionately more allocated to agriculture. Nationally, about 75% of water consumption is used in agriculture, while settlements and industry use about 17% and 8% respectively.